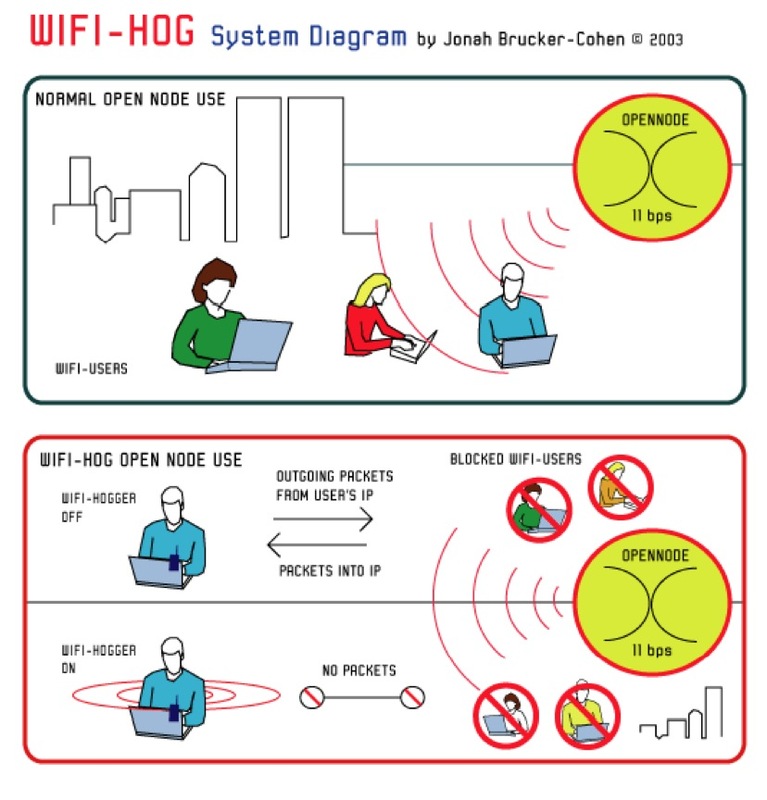 WIFI-HOG – 2003 | JONAH BRUCKER-COHEN, PH.D. WIFI-HOG – 2003 – JONAH BRUCKER-COHEN, PH.D.
A tactical tool to liberate public WiFi Nodes. 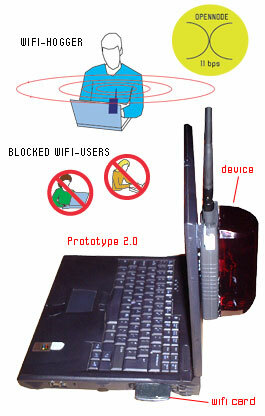 Wi-Fi Hog is personal system for a laptop or portable computer that enables people to gain complete control over a public access wireless network. The idea is presented as an alternative to the utopian vision of wireless networks being open, shared, and utilitarian for everyone. This project is a cautionary one, and comes as a reaction to the battle over free wireless spectrum where corporate pay-per-use and free community networks are fighting for signal dominance in public spaces. Wifi-Hog exists as a tactical media tool for controlling and subverting this claim of ownership and regulation over free spectrum, by allowing a means of control to come from a third-party. 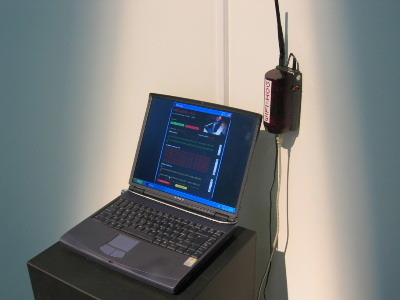 Aimed specifically at public wireless nodes, the WiFi Hog system exists as a laptop connected to a Portable Video Jammer (PVJ) that communicates to software consisting of a packet sniffer and wireless stumbler which monitors incoming packets from an open node. Only traffic originating from the Wifi-Hogger’s IP address may access the connection, otherwise the PVJ is switched on, blocking others from accessing the open node. 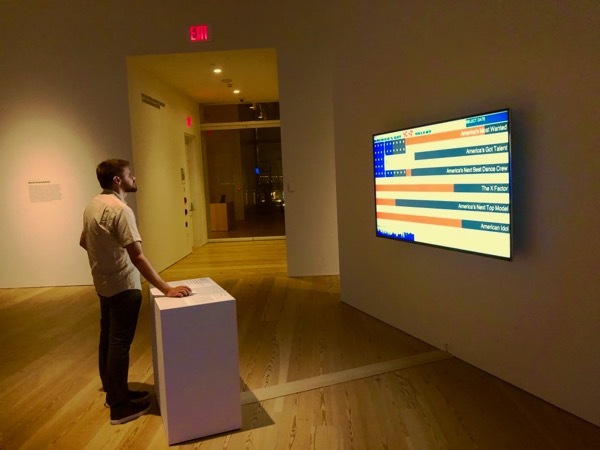 The project attempts to discover if adding constraints on a network and making access to it more competitive and “territorial” changes the relationships between people who use the network. As mobile and wireless devices become more ubiquitous, free and public wireless nodes have gained high penetration. Free nodes are popping up in public parks, airport terminals, libraries, schools, and other venues worldwide. In addition to sanctioned spaces for the nodes, private nodes without encryption are leaking from offices and houses onto city and rural streets. Like any other urban space or public monument, despite public ownership and responsibility, there are still individuals and groups who make their voices heard. From graffiti street action to sit-ins and demonstrations, public space has become the ultimate open territory for everything from protests to social networking to memorials to private encounters. Since mobile technology has entered public space and brought private conversations and interactions along with it, there’s an interesting rift between what is deemed as an acceptable use of public space. Looking specifically at free wireless access points, WiFi-Hog is a reaction to the public spaces they inhabit. If the option exists to connect and the network is made available then why can’t people use it in any way they want – even block it. 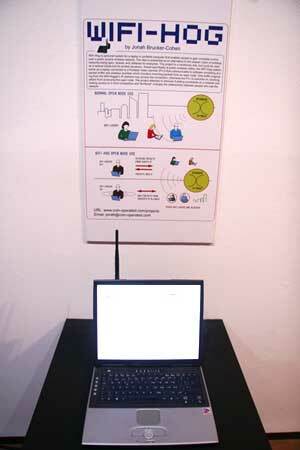 WiFi-Hog is a personal tool to enable both private interaction in public space as well as social obstruction and deconstruction of shared resources. This approach could shift the idea of a network from a shared experience to one of individual connections between people and their link to the Internet – ie. the dissolution of LANs. The project is based on a similar idea of how property was acquired before zoning laws and how land was a public resource that had to be regulated (such as the Homestead Act of 1862 *see note below) due to people using it in ways that the public or government objected. My aim is to investigate how the same could be said about Wi-Fi networks, if they leak or pervade into public space they should be used in any way the person inhabiting that area wishes to use them. Internationale Kulturtage der Stadt, Dortmund, Germany. ZEMOS98, Reclaim The Spectrum Exhibition, March 13-19, 2006. FutureSonic: Mobile Connections, April 29-May 5, 2004, Manchester, UK. “Wi-Fi Hog, prendere il controllo di una rete wireless”, Neural.it, September 18, 2003. “WiFi Hog – Early Xmas For Nihilistic Technofetishists”, Technovelgy, November 9, 2004. 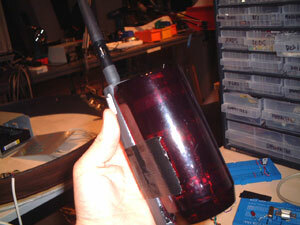 “A tactical tool to liberate public WiFi Nodes”, We Make Money Not Art, November 8, 2004. 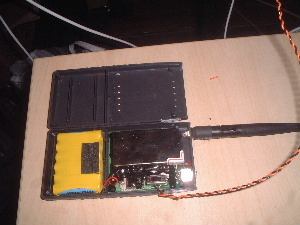 Since most wi-fi networks operate on the 2.4 and 5 GHZ band, Wifi-Hog uses a standard Portable Video Jammer (which also blocks wireless X-10 Camera signals), which is modified slightly to communicate with a PIC microcontroller and accepts power from a USB connection. The WiFi Hog software runs on the user’s machine (Mac OSX/Win 2K / XP) and functions as a packet sniffer / wifi stumbler to find any open wireless nodes and detect incoming and outgoing packets. The packet sniffer looks for outgoing and incoming packets with headers that include the local IP address of the WiFi Hog user’s machine. 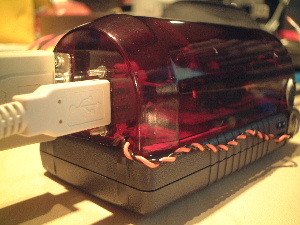 If these headers are found, the jammer is switched off, and the packets can flow freely. 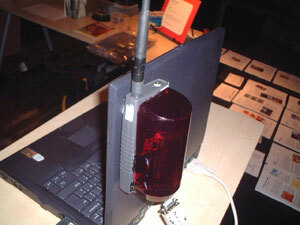 If no IP headers match the user’s machine, the jammer is kept on, blocking everyone else from accessing the node. The Homestead Act of 1862 in the USA provided that unoccupied public land be transferred to a homesteader after five years of residence. This was an act sanctioned by the government in the US to create a system of land grants to encourage settlers to develop the then uninhabited West. In effect, the Homestead Act was a pay off for settling in the region. Wifi-Hog is very different from this since it represents an almost ‘hostile’ takeover of this land. Imagine if you had lived on the land for 3 years, it was still in the public domain, but you had invested your life into it, and someone came along and fenced off the land with a fence you could not penetrate. In this case you do not have any legal right to the land, but you still feel as if it is yours since it has been in your custody for 3 years. This is a scenario closely linked to Wifi-Hog’s premise that a public wireless network maybe be partially owned or maintained by someone, but it can nevertheless be taken away and controlled. Wifi-Hog installed at Reclaim The Spectrum (3/13-19/06).